The Heathcote River doesn't have any elegant 19th Century crossings, because it meanders through suburbs built after WWII. Instead, there are a lot of footbridges to get kids to school and a few road bridges. The footbridges are well-designed to carry pedestrians but they don't have any details to resist lateral loads. 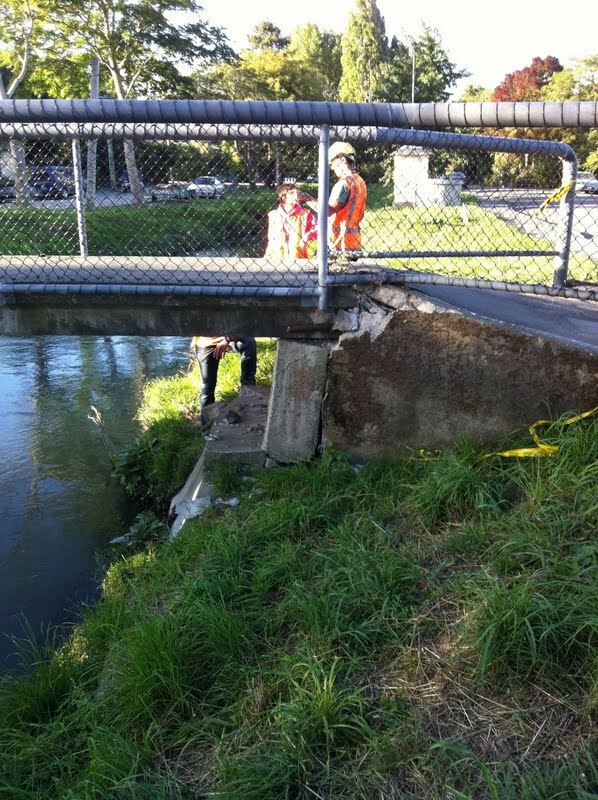 Note how the abutment was broken from a combination of strong shaking and lateral spreading during the February 2011 earthquake. However, it is held in place by the embankment and continues to support the superstructure. New Zealand's Bridges: Malcolm Avenue Footbridge across the Heathcote River in Christchurch by Mark Yashinsky is licensed under a Creative Commons Attribution-NonCommercial-ShareAlike 3.0 United States License.